I love this room so much I’m not sure how to begin. I suppose we’ll just walk through the doorway. Shall we? It all starts with my giant, South-facing window. It lets in so much light. You’ll notice my Cleveland thrift store curtains: I’m starting to grow out of them, but they still make me so happy. Speaking of the doorway: I removed the door. Don’t tell my landlord, but it’s currently residing in my bedroom closet. The door opened into the room, and since the room was small to begin with, the door only added to the cramped feeling. Now it’s open to the adjacent living room, which makes both spaces look and feel bigger. The only downside? 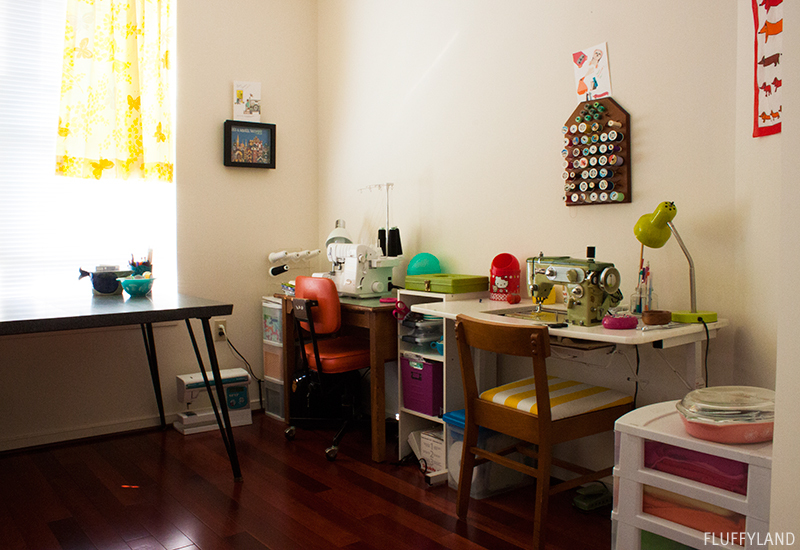 The sewing room can be seen by everyone, so it can’t be a mess. 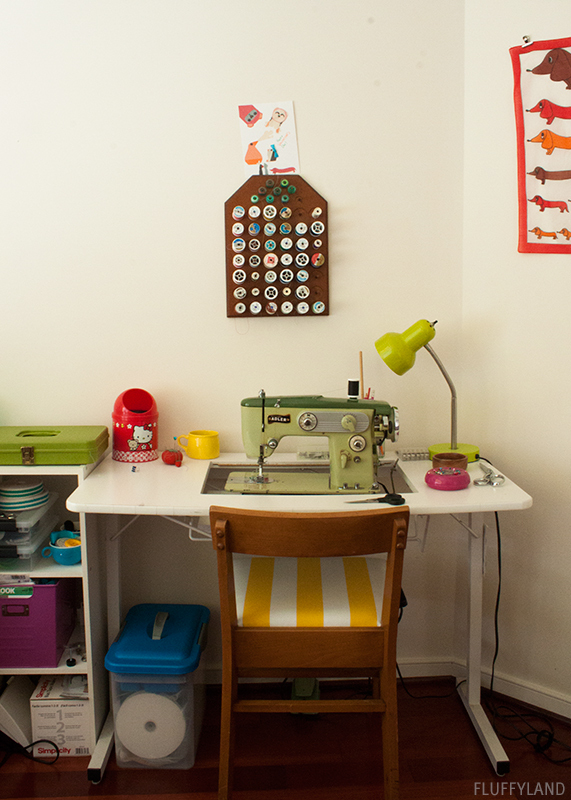 But I love showing off the sewing room, so I would have tidied it for visitors regardless. The big table was my dad’s homework table when he was in college, and then it was our family’s kitchen table back when I was a baby. 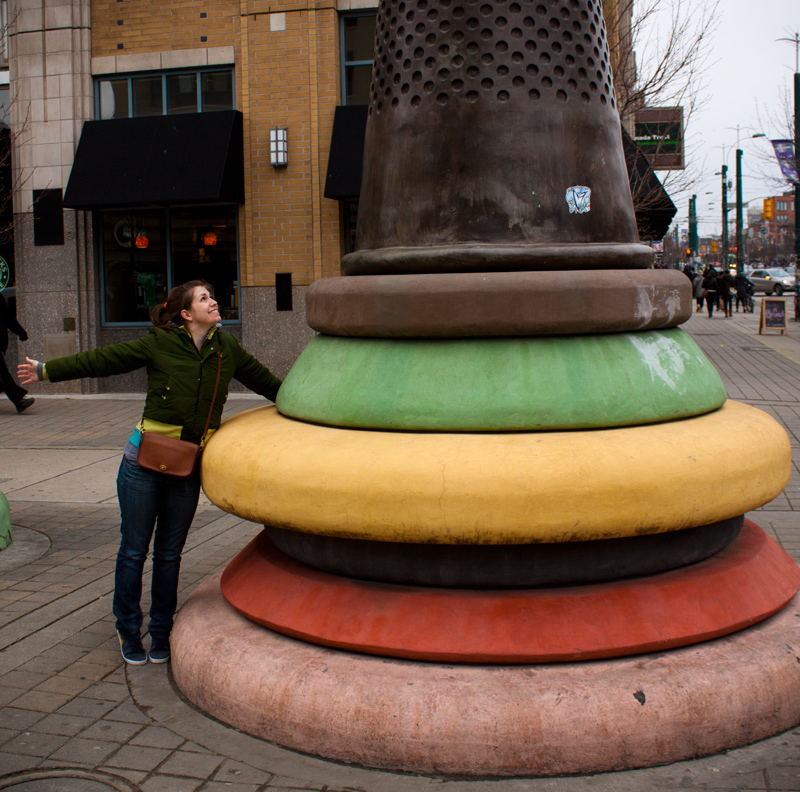 I love it because it’s smooth, easy to wipe, and solid – it can hold anything. I’m trying to keep it clear so I can use it for cutting or spur-of-the-moment projects, but that’s always a challenge. 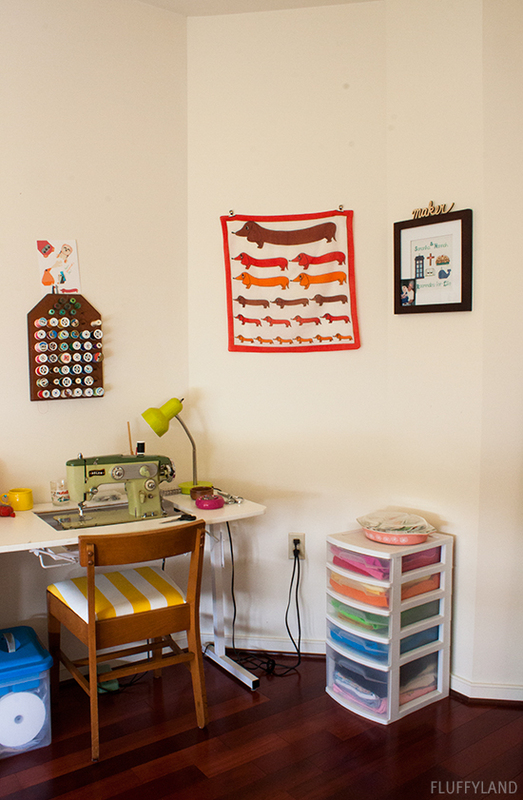 After gazing toward the remarkable window light, if you turn to your right you’ll see my sewing machine wall. I have a small plastic 3-drawer chest of fabric in the corner, then my serger on a loaner desk from my mama, where I sit in my favorite orange rolling chair. A mini 3-shelf bookshelf holds my thread box, supplies, and patterns. Then I’ve got the straight-stitch station, currently featuring the amazing Belvedere Adler that I snagged at the thrift store a few weeks back. $15, 42 pounds of cast iron. She’s a beast and a beauty. She does zig-zag stitches as well as straight, and obviously sews through everything I’ve tested yet. My Husqvarna Viking is on deck for buttonholes, fancier stitches, and walking foot projects. Here’s a close-up of the serger station. The tiny desk is perfect, since the serger is relatively self-contained and doesn’t need as many accompanying notions as a regular sewing machine. The Small World art was created by my mama, and the drawing is last year’s birthday card from Brad (they get better every year!). I know you were dying for another peek at this 1964 Adler. It’s so cool. And you may recognize this as the reupholstered sewing chair from last year… it’s a good chair. The doorway is just to the right of the fleece bin, and then there’s another wall at a funny angle. This estate sale bookshelf was a great find – it’s shallow enough that it doesn’t interfere with the doorway, or the closet door to its right. The shelf houses some regularly used supplies, and then I took advantage of free wall space to hang my rotary mats and rulers. They’re basically art. Continuing around the room, there’s a tiny door that opens to a very petite closet. This closet was literally the LAST thing to get organized after the move. Unfortunately, unpacking takes forever, so I had to prioritize. 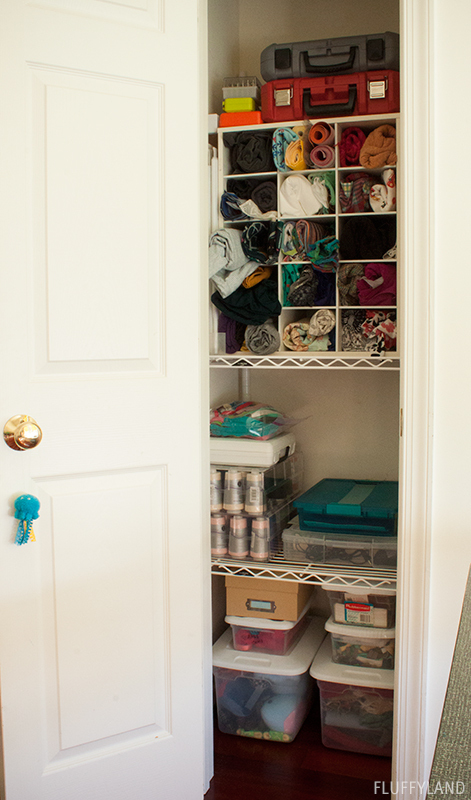 Kitchen supplies, clothes, toiletries… every room in the house required more urgent organization than my fabric closet. When I finally emptied this closet of the bags and bins I had stuffed in there as “hold space”, I was thrilled to approach it with a better vision. The goals were: nothing large, since the closet door is significantly smaller than the closet itself; a well-organized space that makes me happy when I open the door; and well-utilized vertical space. The wire shelving, even though there are only two shelves on the fixture (it was already here), help push everything up. And the shoe organizer holds fabrics at-the-ready: ideally, every fabric in this station is earmarked for a project in the near future. And I’ve already used one of the rolls since taking this picture! Points for me. After finally turning the closet into a functional, joyful storage area, I couldn’t contain my excitement. I spent the entire following workday loudly lamenting the fact that I couldn’t just sit at home all day and stare at my closet. 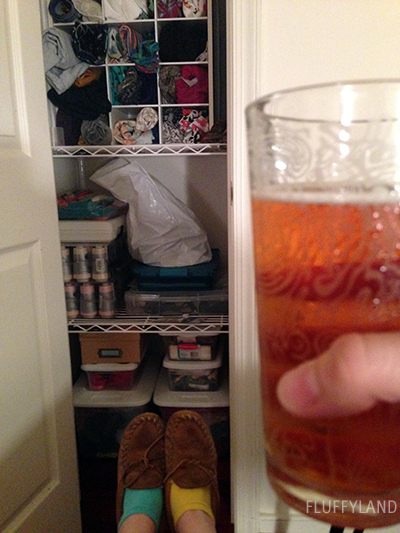 When I finally left after 8 long hours devoid of fabric-closet-gazing, I proclaimed that I intended to sit in my sewing room, put my feet up, eat my dinner, and drink a beer while staring at my closet. The iPhone photo above serves as testimony to the truthfulness of that statement. What a wild evening. What kind of sewing room tour concludes without showing off some pretty bowls filled with pretty things? The Pyrex is half of the Balloons chip & dip set, a gift from the amazing Bradley one Christmas. The whale pitcher and the Raku-fired pot are my favorite pieces from the semester of ceramics that I took in college. I love displaying pretty supplies. The best part about this whole tour is the fact that I took these pictures about a month ago, and it’s already even better. I’ll keep you guys posted on the improvements! 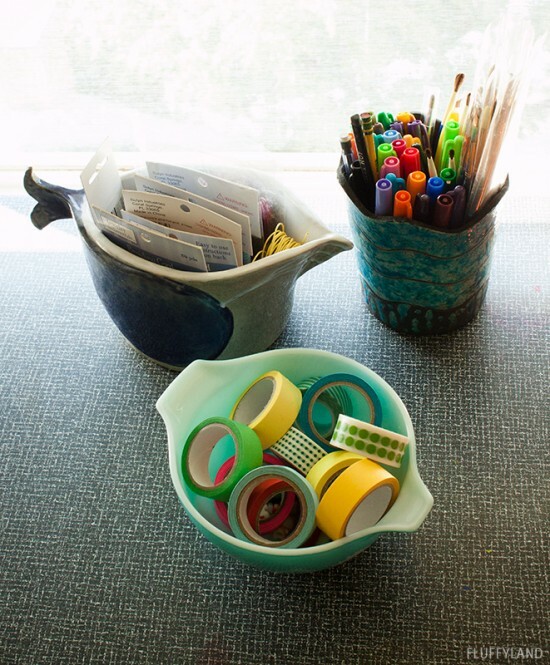 With each project I work on, I think of yet another way to make the space more efficient. 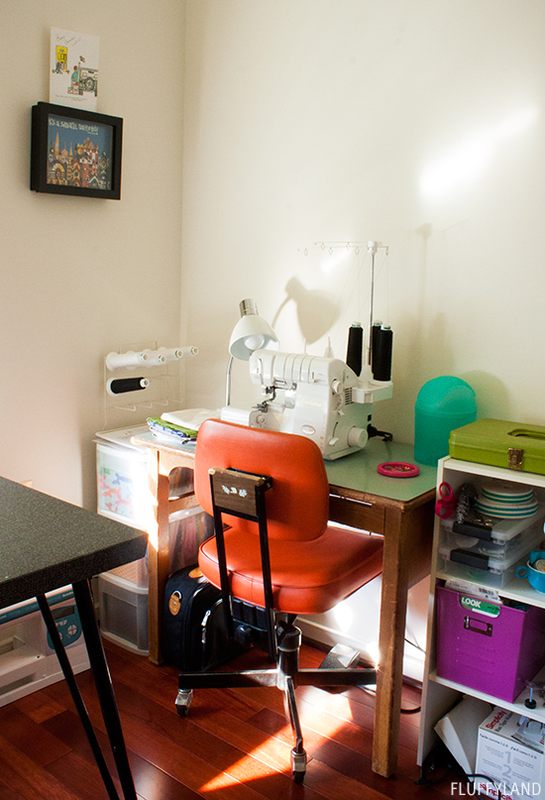 It’s hard to judge the organization of a sewing room until you’re sewing in it… so it’s constantly evolving. And I’m loving it all. I have missed your blog. 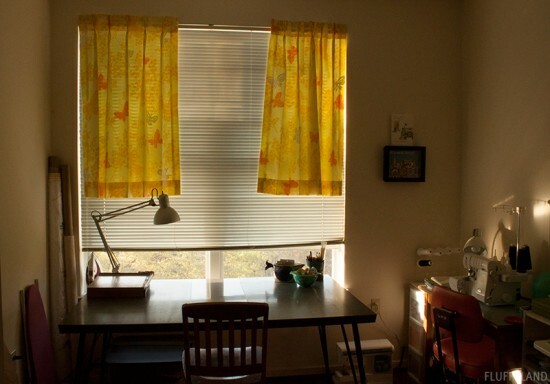 I dream of a sewing room with a window. Someday! Your room is amazing Sam! So fun! SAM! You’re back :) So happy to see you in blgoland again. Also, your sewing room is AMAZING! That window! 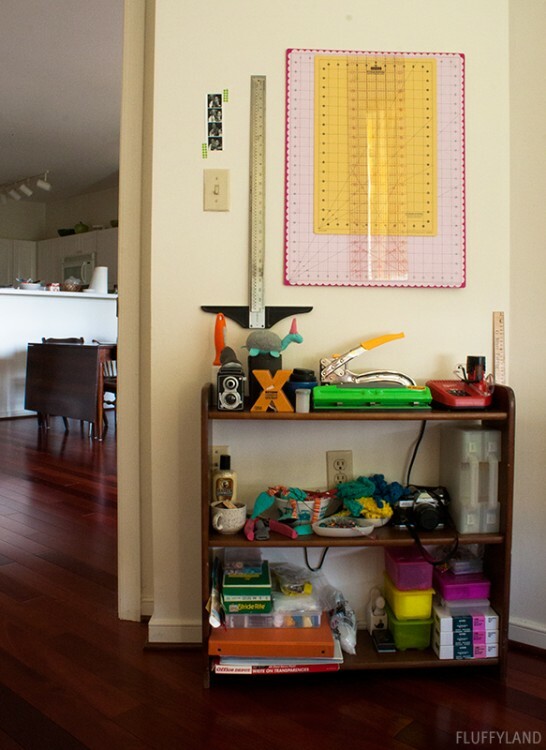 Like it was destined to be a craft room. Your Adler machine looks gorgeous – next time we see each other we’ll have to go sewing machine thrifting. Obviously you’re very talented ;) Btw, what happened to your orange beauty from Germany? Oh and to finish off this super long comment: I LOVE YOUR WHALE BOWL! I don’t know if you want to take a 42 pound machine across the ocean… the orange one (at 16 pounds) was already a heavy carry-on. 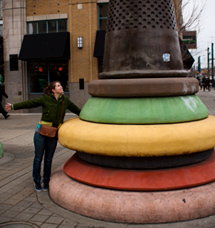 BUT we can thrift all sorts of lighter weight things!! There’s lots of thrifting to be had here. And the orange beauty is on display in my living room! I’m still too scared to hook it up to a voltage converter, but we’ll see. I know that one would also sew beautifully. I also love that whale bowl. Ceramics can be very unpredictable, and I had a lot of not-so-pretty pots, but that one came out just how I wanted it to. YAY.